Cao (centre) celebrates with Rao (left) and Cong (right). © Jacob Ebrey Photography / SRO. Matt Rao took a victory and two 2nd places at the fifth British Formula 3 round at Thruxton at the weekend, to keep ahead of title challenger and Fortec teammate Martin Cao. In what can only be described as a desperately poor turnout – only five cars entered the round – Cao registered his first wins of the season, but Rao did enough in the final race to keep a four point lead. Despite securing pole, Rao was unable to convert Race One into a victory after he bogged down on the line, allowing fellow front row man Cao to slips into the lead. An early safety car period for the crashed Camren Kaminsky and Max Marshall allowed Rao to catch up and quickly pass Cao; however the Chinese national made a move on the 15th lap, although clattered Rao in the process. 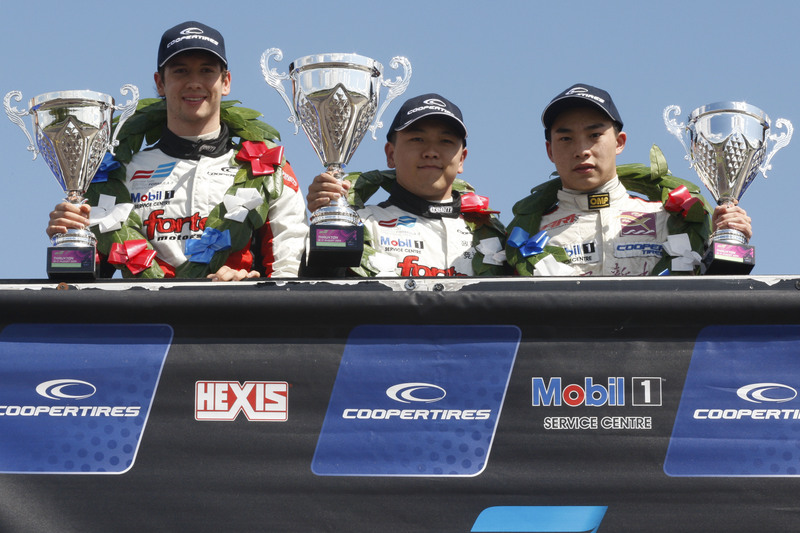 Li Zhi Cong took 3rd for Carlin in the ageing F308 chassis. Cao added a second victory on Sunday morning when he conquered the damp, but drying Hampshire circuit. A scare on the warm-up lap when he nearly stalled his engine heightened Cao’s senses to a degree and from there; the Fortec man romped into an early lad from 4th on the grid. With a dry set-up, Rao took time to settle in, but finished 2nd – again ahead of Cong, while Marshall and Kaminsky rounded out the quintet. Rao took one back on Sunday evening to regain the series lead. Another poor start dropped Rao behind Cao, but the former was back ahead by the end of lap one and soon pulled out a strong lead to win by 6.58s. Kaminsky took his first F3 podium ahead of Marshall (4th), while a delayed Cong closed the field. The series will move to Brands Hatch for its penultimate round in two weeks.